A cairn commemorates Governor Phillip`s first overland journey from Manly towards Pittwater. The location of the cairn was named Governor Phillip Lookout in 1934. In August 1788 Phillip accompanied by an exploration party travelled overland from Manly Cove to Pittwater and back. To commemorate Governor Phillip's first overland journey from Manly towards Pittwater in 1788, a cairn, erected by the Manly, Warringah, and Pittwater Historical Society, was unveiled by the Minister for Works (Mr. Buttenshaw) on Saturday afternoon. Nothing was lacking to make the ceremony as impressive as possible. Several hundred people assembled on Beacon Hill, 487 feet above sea level. The proceedings were opened with a short address of welcome by the President of Warringah Shire (Councillor Corkery), after which the Surveyor-General of New South Wales (Mr. H. B. Mathews) read a copy of the scroll which is placed within the cairn. This stated that the cairn was erected on the site of the original beacon established by the Department of Lands In December, 1881, and was observed by Surveyor J. Brooke, in August, 1883. The road leading from Brookvale was surveyed by Surveyor W. L. King in May, 1887. The Sydney Morning Herald (NSW), 4 November 1929. Manly Warringah and Pittwater Historical Society has arranged for the official naming of the summit of Beacon Hill, near Brookvale, (where the society erected the cairn), as "Governor Phillip Lookout" on Saturday afternoon next, at 3 o clock The event will also commemorate the 143rd anniversary of the first overland journey of Governor Phillip from Manly towards Pittwater on April 15, 1788. The Sydney Morning Herald (NSW), 14 April 1931. 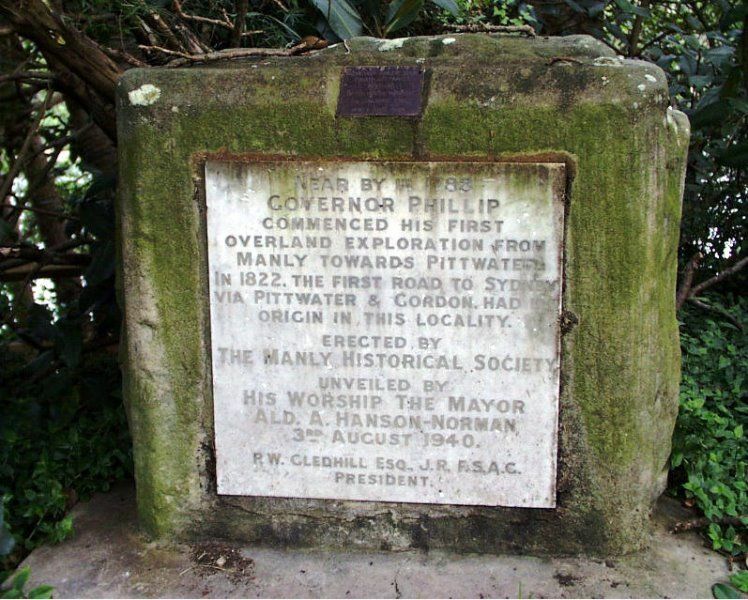 Near by in 1788 Governor Phillip commenced his first overland exploration from Manly towards Pittwater. In 1822, the first road to Sydney via Pittwater & Gordon, had its origin in this locality. P. W. Gledhill Esq., J.P. F.S.A.C. President.